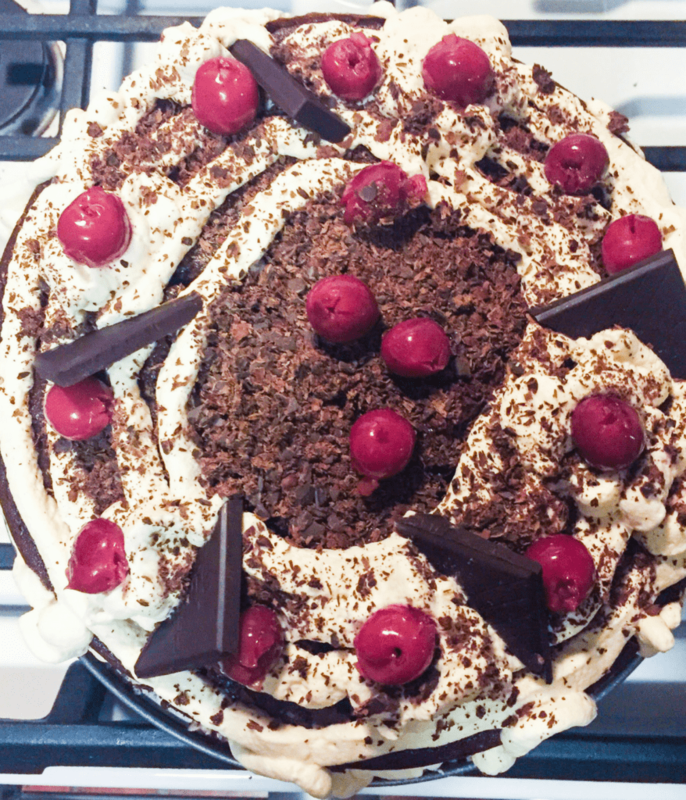 Black Forest cake is a tradition for my husband and me. It’s the cake we ate when we got engaged, the cake we ate on our wedding day (and anniversary), and now the cake I ate on my 30th birthday. Except this time, my husband made me my very own low-lectin compliant Black Forest cupcakes, using a few special ingredients. Black Forest cake is not named after the German Black Forest mountain range itself, but rather the liquor they distill in the region called Schwarzwälder Kirschwasser, or “Black Forest Cherry Water.” Kirschwasser is distilled from sour cherries, and it’s the most important ingredient in Black Forest Cake. In fact, if you leave this ingredient out, German law wouldn’t even allow you to call it Black Forest Cake. Indeed, some Germans claim you should be stumbling away from the table after a serving of Black Forest Cake. Perhaps if you’re baking these, you’ll want to make an adult version and a kid’s version. I will, of course, be showing you how to make the adult version. Sour cherry juice may be substituted for Kirschwasser, in the event you can’t find the specialty liquor or you don’t particularly feel like getting drunk from a cherry chocolate dessert. This post contains Amazon affiliate links. Please read my Amazon Associates Disclosure on this page for more info. 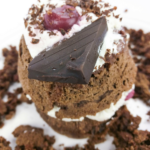 One of the best things about Black Forest Cake is it’s not supposed to be very sweet. The “Americanized” version of this cake (and most every other cake) has sickeningly sweet icing with a pound of powdered sugar to override the alcoholic flavor. With this recipe, we’ll be embracing the flavor of the Kirschwasser by soaking the cherries in it, and coating the cupcakes with a lightly sweetened whipped cream to counteract the richness of the chocolate and, uh, strength of the alcohol. 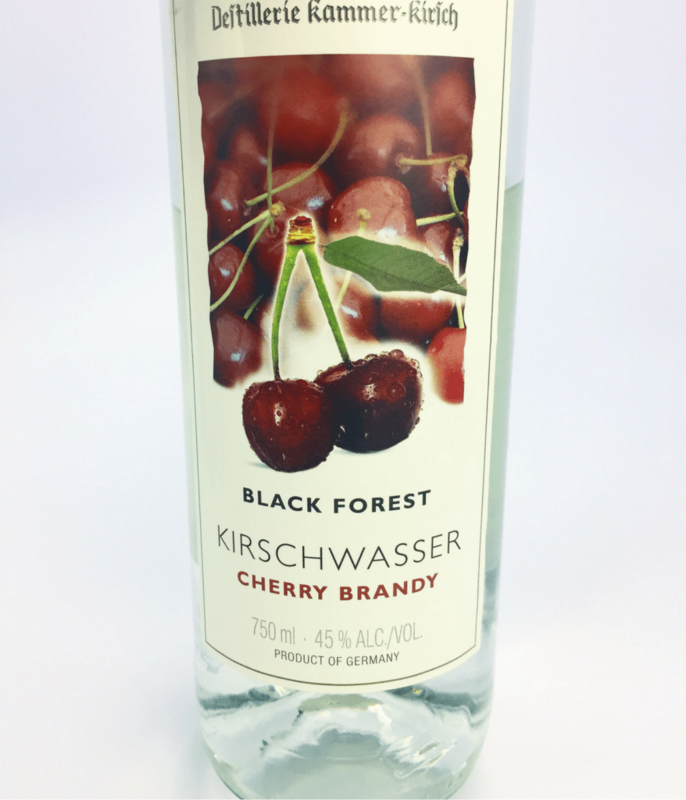 My husband had to drive 45 minutes to a specialty liquor store to find it, but we got our hands on some Kirschwasser imported straight from the Black Forest region of Germany. Very unfortunately, Amazon hasn’t entered the alcoholic spirits market as of yet, so I say “Godspeed and good luck” on finding this stuff at a liquor store near you. Alternatively, you could use cherry brandy or unsweetened tart cherry juice, which can be found at most any grocery store. There are two basic types of cocoa powder: natural and Dutch process. Cocoa powder is naturally bitter and acidic. Dutch processed powder is cocoa that’s been treated with alkaline to make it more palatable. Because we’re using baking soda in this recipe, which acts as an alkaline, we can use natural cocoa powder, although it’s not a huge deal to sub in Dutch process. My favorite brand of cocoa powder is a 1-pound bag of raw, organic cocoa powder with the perfect texture and flavor for this particular recipe. It’s available through Amazon Prime. The flour is where we start to veer from tradition and make substitutions that our bodies will like. Cassava flour is the closest consistency to wheat flour I’ve been able to find. It doesn’t have a strong flavor, and it yields the soft, light texture we’re looking for in a Black Forest cake. 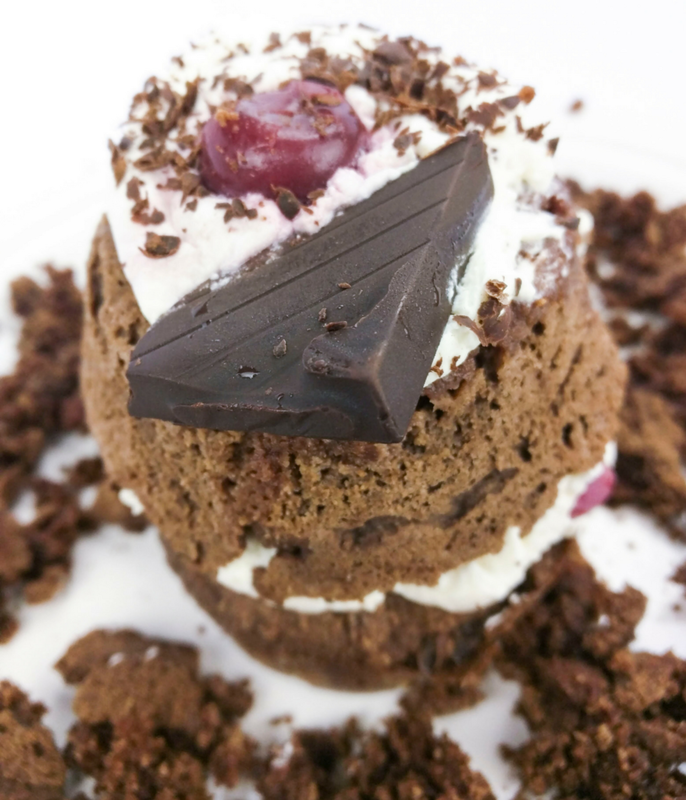 Black Forest cake is traditionally a sponge cake, but since we’re not working with gluten, it will be very difficult to get a spongy texture. Instead, we’ll have to settle for a fluffier, chewier texture that–on the plus side–is not nearly as temperamental as sponge cake. My favorite brand of cassava flour is the best brand I’ve found for both consistency and mild flavor–I use it for everything from tortillas to compliant desserts. Get it through Amazon Prime. Get a 1 cup liquid measuring cup and pour 1 tablespoon of white vinegar or fresh lemon juice into it. Fill the rest of the cup with coconut milk until it reaches the “3/4 cup” line. Let it sit for 10 minutes to allow the lemon juice or vinegar to “curdle” the milk. Now, it’s ready to use in the recipe! Instant espresso is sacrilege, but, unless you have an espresso machine or feel like making a stop at the coffee shop, we’re using a tiny bit of instant liquid espresso in the filling to get an amazingly rich flavor that will enhance the chocolate. I can usually find this brand at my local grocery store. Get 100% cocoa, unsweetened baking chocolate. The point of the shavings is purely decorative, so we don’t need more sugar. We want the bitter flavor. Use a zester or the small side of a cheese grater to shave chocolate. Ideally, you’ll use fresh cherries, in season. You can find pitted cherries in the frozen fruit section of a grocery store. Look for organic flash frozen or fresh frozen for cherries that were frozen when ripe, soon after picking. There’s one thing you need to do the night before: soak the cherries in the alcohol. If you’re using fresh cherries instead of pitted frozen, you’ll need to pit the cherries first. Either way, the pitted cherries need to soak in 1/4 cup of kirsch overnight. You should be able to light these things on fire when you put them on the cupcakes. Black Forest cake has been my favorite for years, ever since I lived in Munich for a summer in college. I knew when I started eating the Plant Paradox way that I would need to make a compliant Black Forest cake recipe. The reason I’m doing cupcakes and not a traditional, 3-layer cake is because the portion sizes are much smaller with cupcakes. Sure, you could eat 3 or 4 cupcakes (guilty), but I’m of the philosophy that desserts are for sharing. Cupcakes are much more portable and much more party friendly than a huge 3-layer cake. Do Ahead: Set aside 18-20 cherries for decoration, and soak the rest in 1/4 cup kirsch overnight. MIX the vinegar and coconut milk together, and allow to sit for 10 minutes. MEANWHILE, sift the dry cake ingredients together in a small bowl, and, in a separate large bowl, cream the butter and sweetener together. Add the eggs to the creamed mixture. Alternate adding dry mix and the vinegar-coconut milk to the large bowl, mixing well as you add. POUR batter evenly into cupcake cups. Start by adding one large spoonful at a time to each cup. Do not fill cups more than halfway. If there’s extra batter, use an additional pan or work in batches. Bake for 15-20 minutes, until a toothpick inserted into the middle comes out clean. Cool and remove the cupcakes from the pan. BEAT the butter until light and creamy. Add the sweetener, salt, and espresso, and mix well. If the filling is too thick (not spreadable), add kirsch or cherry juice, 1 tablespoon at a time. WHIP the cream, vanilla, sweetener, and kirsch in a cold bowl until it forms stiff peaks. DECORATE the cupcakes using a pastry bag filled with the cream or a cake decorating tool. Alternatively, spoon whipped topping onto each cupcake and gently shape into a “mound.” Place a decorative cherry and some chocolate shavings onto each cupcake. 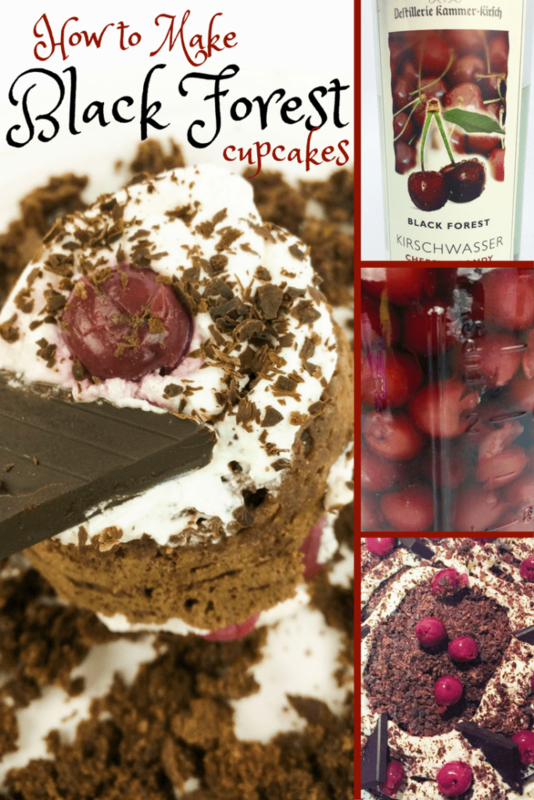 This traditional German dessert is made lectin free, grain free, and low glycemic with these black forest cupcakes. Serve at a "spooky" soiree or at any cold weather holiday gathering. 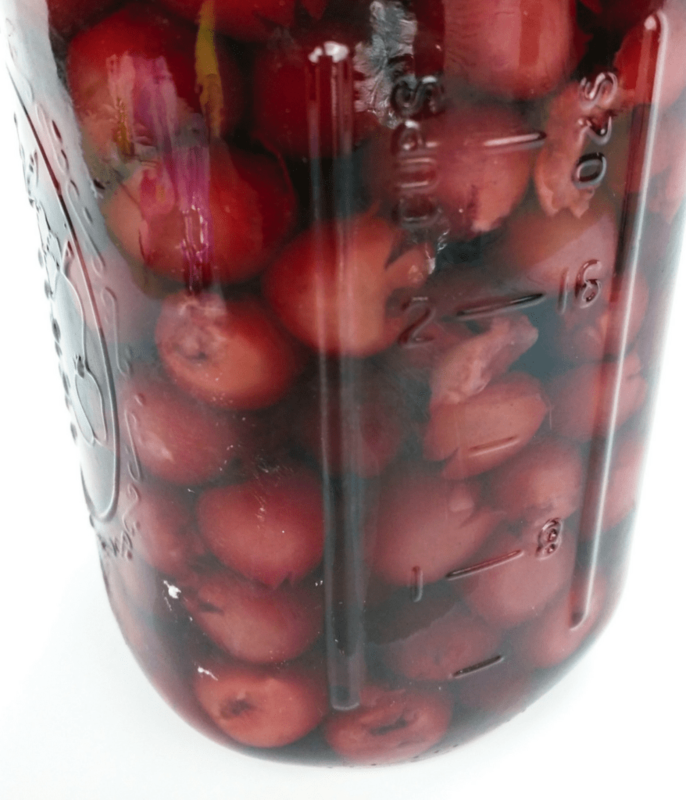 Set aside 18-20 cherries for decoration, and soak the rest in 1/4 cup kirsch overnight. MEANWHILE, sift the flour, cocoa powder, baking soda, and salt together in a small bowl, and, in a separate large bowl, cream the butter and sweetener together. Add the eggs to the creamed mixture. Alternate adding dry ingredients and the vinegar-coconut milk to the large bowl, mixing well as you add. POUR batter evenly into cupcake cups. Start by adding one large spoonful at a time to each cup. Do not fill cups more than 2/3 full. If there's extra batter, use an additional pan or work in batches. BAKE for 15-20 minutes, until a toothpick inserted into the middle comes out clean. Cool and remove the cupcakes from the pan. CUT each cupcake in half. Pour 1 teaspoon of kirsch (that the cherries have soaked in) on the bottom half of each cupcake, then spread with a layer of filling, and a small handful of soaked cherries. Replace the top half of each cupcake on the layer of filling, to make a "cupcake sandwich." DECORATE the cupcakes using a pastry bag filled with the cream or a cake decorating tool. Alternatively, spoon whipped topping onto each cupcake and gently shape into a "mound." Place a decorative cherry and some chocolate shavings onto each cupcake. This looks amazing. Your post is beautiful and organized!!! I am going to have to try this!!! Thanks for sharing!